(COHEN) Trust GONE VIRAL! (SUTTON) My point is this: Trust is a violent act. You think that we should have a conversation about TRUST? I talk about trust and leadership a lot and I believe that you need both but as pointed out to me by my good friend Matt Sutton, we are diluting the value of these words. In a paper put out by Harvard Business Review they talk about leadership and of course all of us collaboration types run to the well. You know what the truth is though? The truth is that leadership is mostly dead. It is like that Pixar movie Wall-e trying to find trust and leadership in an environment that we consume and kill everything in our path. A few years ago I asked leadership in my organization how many Industrial Psychologists we have on staff in order to help teach leadership how to understand and work with people better, the answer was none. Not one, because while people are the most important asset, they are only important when the organization is lacking in some capacity. It is like air, you aren’t missing it until you have none. Leaders today are more than not politicians that say things they don’t mean or can’t support and trust is the word they use to make it sound as-if. In my years of working I have seen great leaders and they are few and when I worked for them or worked with them, I knew because trust was an activity, more than just a word. Have you ever had your life in someones hands? Have you even had someones life if your hands? We all have but we have forgotten because it is easy to forget who and what we are. It is easy to put out the list of 5 things you need to know to be a great leader. It is hard to do the work and lead from where you are. If you’re a worker in the trenches trust means two things that are important to both leadership and to environments were you work with people remotely. 1. Knowing Right from Wrong. In the absence of religion, corporations establish “Core Values”, “Morality Clauses”, “Codes of Conduct”. You get the idea. Something to provide a pseudo moral compass. Ironically I have never seen the number one core value (or whatever you want to call them) on corporate literature. Making money. We know the business needs to make money so the real question a person working has to ask, “Will meeting the profit goals of the company come at my expense?” In order for workers to even begin having trust in their leadership they need to know that the powers that be aren’t going to be the ones lighting our final cigarette in front of the firing squad of profit. 2. Gauging whether our coworkers or leadership know right from wrong is tricky. Historically that kind of insight usually comes from life-n-death situations where self-preservation strips away all of our pretenses. In the corporate world it usually comes from an equally scary dice roll of putting ones self out there to be judged by your peers and see who steps to support you. But isn’t that the whole point of trust? To know whether your peers and leadership has your back when you do take risks or get in tight spots? Few are the people who take such risks and fewer are the ones who survive it. Finally, if you are at all interested here is the discussion that ended with more discussion. Don’t look for correct grammar it is a chat but the conversation was interesting. writer begins by commenting on how smart they are? You would punch me then, when I see you, you can punch me. 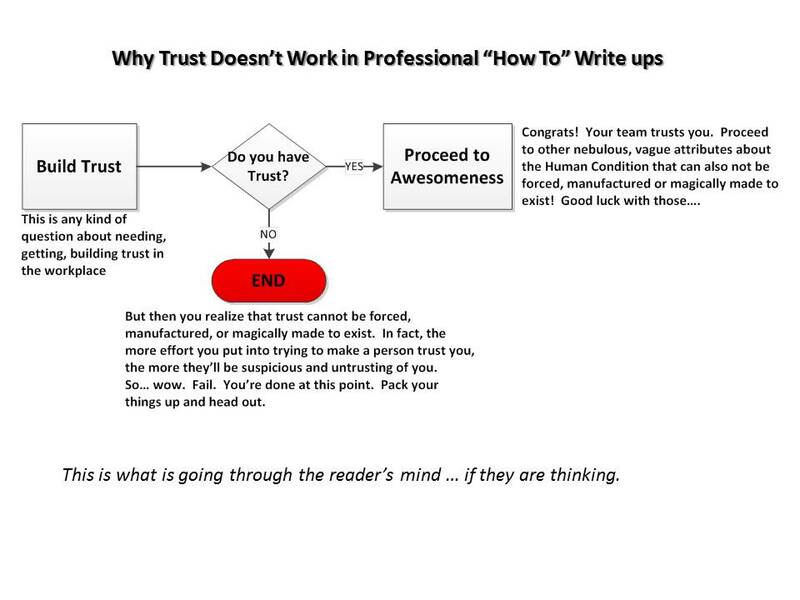 My thing with “trust” is that it is a nebulous and vague attribute. What tasks are associated with that? What have we done? What are the results of our past interactions? Do we bad mouth others? Are we enablers for us or enablers for me? Does this dress make me fat? what I can / should do to right myself. You have my trust and that is important. It is number 1 important. what time and what circumstance. That is trust.. it is clear and to the point and detailed not vague. or give via a token. It has to be nurtured like a flower. relationships trust diminishes over time. Matt: I am calling you and talking to your wife right now. EXCELLENT post. A wise man once told me “It’s all about people.” If you have a great network of people and the ability to reach-back to those in times of need, then you can’t fail. An employer should know that when they hire you, they hire your network. And your network (if built correctly through TRUST and lasting relationships) can not have a price put on it. People helping people. It’s a beautiful thing. Is there a relationship between trust and faith? Is faith a higher order of trust as if you will trust your life on something or to someone and that is the higher order? Seems that we have lost our leadership to too many special interests, which means trust is only tied to how long our leaders want to spin something for what they may think is the better good or maybe their own personal gain at a moment in time. Problem is the grey areas still live in our environment no matter how much trust you give someone. Who started this trust thing? Was it Adam when he ate the forbidden fruit? Recall that God didn’t then mistrust Adam, but set him on the path to earn it back from within his own self…it wasn’t for God’s benefit. God doesn’t need to trust anyone; he is God. But the thing that we must always remember is that God never stopped loving us even when he put Adam and Eve out of the garden. The environment changed but love is constant from the creator; so if you want to trust someone, think first to the one that is constant. From there you will have enough courage to trust others as the void of trust is always half full not half empty when you have the peace in your heart from the overall love of our Creator. Sorry, if I have offended anyone but I TRUST that it will all work out in the end.